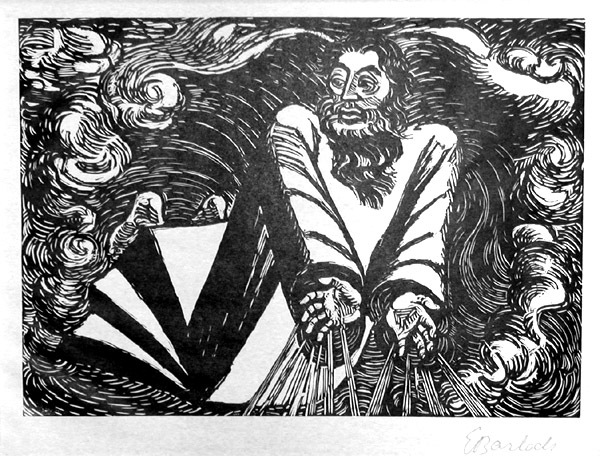 In 1920-21 Barlach made seven woodcuts to illustrate his series, Die Wandlungen Gottes / The Transformations of God. It was published in a deluxe edition by the Pan Press of Paul Cassirer (Berlin, 1922) in an edition of 121 numbered I-XI and 1-110, of which 10 were printed on special Butten paper for Barlach and 100 on Japon paper, all with the woodcuts hand-printed and signed. After this first printing, a popular edition was printed from zinc plates made by galvanotype from the original woodblocks and published by Paul Cassirer, also in 1922. These were unsigned. The series begins with God creating the universe and ends with him resting. In between however, Barlach gives the story of creation a distinctly modern twist, including a new dance of death. 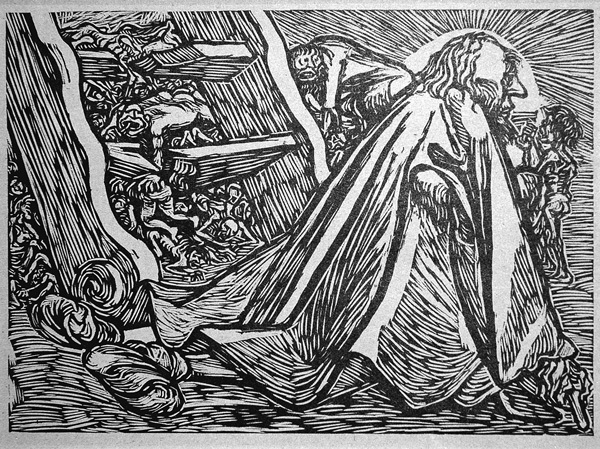 WIth the exception of The First Day, all of the original woodblocks were destroyed during Barlach's lifetime. We have some of the signed impressions and a complete set of the second 1922 edition printed by galvanotype. The Transformations of God. Seven woodcuts. With selections from his writings. trans. 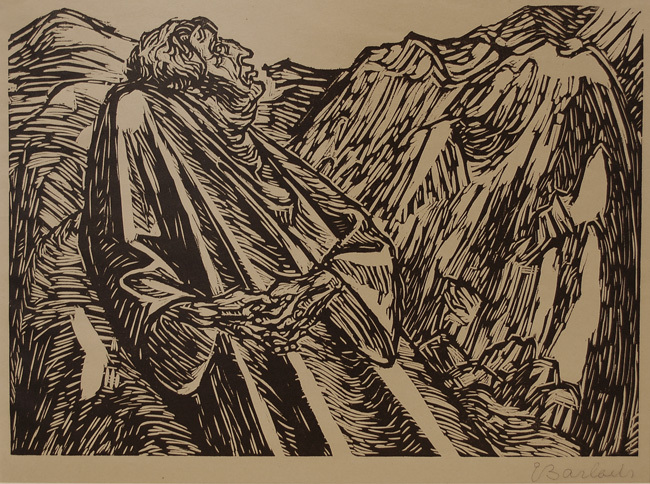 Naomi Jackson Groves (Hamburg: Christians, 1962); Bruce Davis, German Expressionist Prints and Drawings: The Robert Gore Rifkind Center for German Expressionist Studies. Volume 2: Catalogue of the Collection (Los Angeles: Los Angeles County Museum of Art/ Prestel, 1989); Friedrich Schult, Ernst Barlach Das Graphische Werk. Werkverzeichnis Band II (Hamburg: Ernst Hauswedell & Co., 1958). Der Erste Tag / The First Day (Schult 164, Davis-Rifkind 98: 1). Original woodcut, 1920-21. Published in Die Wandlungen Gottes / The Transformations of God, plate 1. Ours is from one of the ten signed sets reserved for Barlach. Handling creases lower left margin, several small chips at margin, not affecting. Exhibited in Expressionnisme Europeen at the Musée d'Art Moderne de la Ville de Paris in 1970. Image size: 257x359mm. Price: $3250. Also available in an unsigned impression from the 1922 Paul Cassirer popullar edition. Image size: 257x359mm. Price: $950. The Divine Beggar (Schult 168, Davis-Rifkind 98: 3). 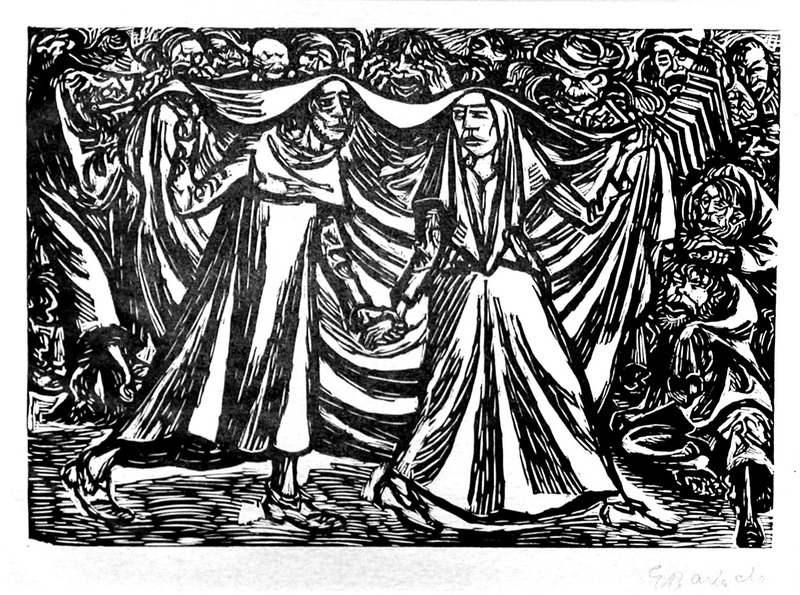 Original woodcut, 1920-21. Published in Die Wandlungen Gottes / The Transformations of God, plate 3. Portfolio of 7 woodcuts published in 1922 by Paul Cassirer, Berlin. Deluxe edition of 121 on Japon, each of which is signed in the lower right corner. Our impression is from the unsigned edition on zinc plates made from the original woodblocks; it is printed on thick brown-tinted paper. Image size: 255x358mm. Price: $950. Totentanz 2 / TheDance of Death 2 (Schult 168 Davis-Rifkind 98: 4). Original woodcut, 1920-21. Published in Die Wandlungen Gottes / The Transformations of God, plate 4. Ours is from one of the ten signed sets reserved for Barlach. Image size: 257x359mm. Price: $3250. Also available in an unsigned impression from the 1922 Paul Cassirer popullar edition. Image size: 257x359mm. Price: $950. Image size: 257x359mm. Price: $3250. Die Felsen / The Rocks (Schult 170 Davis-Rifkind 98: 6). Original woodcut, 1920-21. Published in Die Wandlungen Gottes / The Transformations of God, plate 6. Ours is from one of the ten signed sets reserved for Barlach. Image size: 257x359mm. Price: $3250. Der siebente Tag / The Seventh Day (Schult 171, Davis-Rifkind 98: 7). 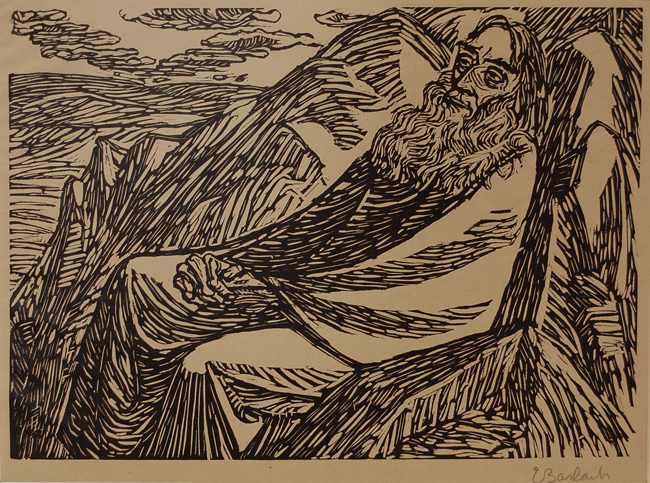 Original woodcut, 1920-21. Published in Die Wandlungen Gottes / The Transformations of God, plate 7. Ours is from one of the ten signed sets reserved for Barlach. Handling creases top left and lower right corners, several small chips at margins, not affecting the image. Image size: 257x359mm. Price: $3250.